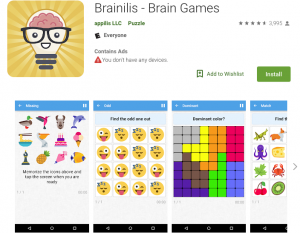 What it is: Brainilis is a free, fun brain game app that lets you work on cognitive skills. Since there are three difficulty levels for each game, it’s appropriate for kids and adults. What I love: I love how simple but fun these games are. It’s a fast-loading app so you don’t need to wait for lots of graphics-heavy portions to load. You don’t need an account to play and you can track your performance over time. There are different levels of difficulty (i.e., easy, normal and hard) so you can choose how challenging you want each round to be. There’s a timer so you can race against yourself, and a “share” button so you can play against others. I like that you can choose the category (i.e., memory, attention, math, logic) or choose the workout, which allows you to challenge different areas of your brain with one game in each category. What I’d change: This game doesn’t work all your cognitive skills. I didn’t run across an auditory processing game, for example.